UPM researchers have identified the changes that are expected to occur in maximum precipitations in the Iberian Peninsula and Balearics due to climate change. A statistical analysis of simulations of a possible future climate has resulted in a database that quantifies the expected percentage changes in the maximum precipitations in the future according, to diverse emissions scenarios. These results have been applied to the review of the Preliminary Flood Risk Assessment carried out by the Ministry for the Ecological Transition to adapt it to the Flood Directive of the European Union. According to Carlos Garijo, a researcher involved in this study: "flood risks are expected to increase in the future as a consequence of climate change. Thus, the update of the Preliminary Flood Risk Assessment aims to identify at a national level the areas where are expected to increase the risks of flood due to climate change and to take measures to minimize the adverse consequences in these areas." Changes in flood patterns can occur as a consequence of natural changes in climate, for instance, variations in precipitation regimes and temperature, also as a consequence of human activities such as the variation of land use or the construction of hydraulic infrastructures. In order to learn how the influence of climate change will affect floods in the future, the first step is to study how extreme precipitation will change since they are usually responsible for these floods. In this context, researchers from the group of Hydroinformatics and Water Management Group at Universidad Politécnica de Madrid have studied the effect of climate change on maximum precipitations. 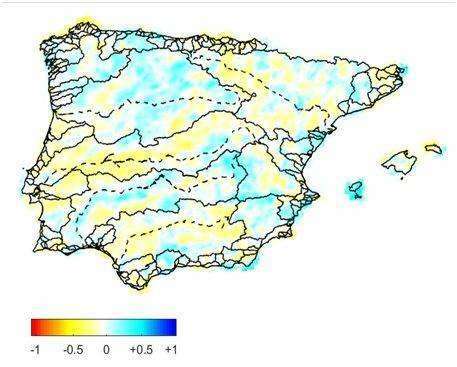 To assess the future behavior of climate, researchers used the results of twelve climate models and identified the expected changes in daily maximum precipitation in the Iberian Peninsula and Balearics. As a result, a database has been protected in the Intellectual Property Registry and includes the expected percentages changes in the maximum precipitations for during future periods (2011-2040; 2041-2070; 2071-2100) and two possible scenarios of future greenhouse emissions. These results have been used by the Ministry of Ecological Transition and the companies involved the review of the Preliminary Flood Risk Assessment to adapt it to the Flood Directive of the European Union that includes the influence of climate change on floods. Luis Mediero, a researcher involved in this study, says, "The database generated allows us to easily obtain the magnitude of extreme weather in the future, thus this study is also useful for city councils and water supply and sanitation companies as well as engineering companies that carry out studies considering the influence of climate change in extreme events."